Julius Wade, Vice President of the Maryland Chess Association, submitted this press release. 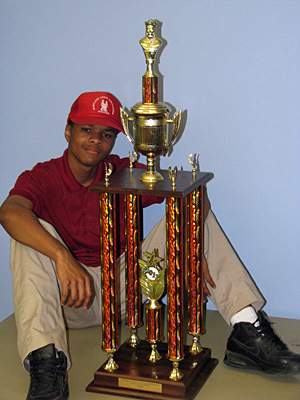 Not since the Scholastic Chess Dominance of such great ones like Nathan Wilson, Troy Williams, Kimani A. Stancil and Antoine Hutchinson has there ever been such a buzz in the air for Scholastic Chess in Baltimore City brought on by 13-year old Ronald Best, Jr. Under the guidance of his father and coach Mr. Julius A. Wade Jr., Ronald has been winning countless awards and tournaments in Maryland. Recently, Ronald captured the title of “Maryland Middle School State INDIVIDUAL Chess Champion”. This title has been elusive from Baltimore Scholastic players for over two decades! Along with this title, Ronald led his school to win the ” Maryland MIDDLE SCHOOL State Chess Championship”. Winning two titles in one weekend was a great accomplishment for Ronald. Last year, Ronald watched as his younger brother, Jordan Best, become the first to win the “INDIVIDUAL” state title for the Primary School Division. In the midst of all the Inner City distractions that many Baltimore teens face, Ronald has maintained focus and continues to inspire many Baltimore Scholastic Chess players with his chess skill. No matter what Baltimore public school you visit, if there is a chess program there, Ronald’s game play is mentioned. Ronald can be seen in a short documentary filmed by the Baltimore Educational Channel 77, describing some of his accomplishments. Jordan and Ronald Best, Jr. showing their trophies. Ronald sharpens his chess skills at the Fells Point Chess Club where he is being mentored by the club’s proprietor, Senior Tournament Director, Wilbert Brown. His current rating is 1850. Some people say that Ronald’s actual rating hasn’t caught up with him as of yet. But, when you ask him, “what is your rating?”, He simply replies, “ratings don’t matter”. Ronald desires to be a doctor as well as a grandmaster in chess. Well young man, ratings do matter… quite a bit. Certainly play the position, not the person (or their rating). Agreed. In this discussion we are actually talking about rating as a measuring stick for one’s development. You have to know where you stand. When I was in high school (Black public school), we had 100 players in the chess club and the coach had an internal rating list. This was the driving force for competition. We all started at the club with a rating of 700 and worked our way up the ladder. We were all under-rated by the time we graduated but it was a useful guide to measure our improvement. So Good Doctor as AStreet master i will agree to add your views to the chess universiity temple of wisdom LONG SIDE TATISM!! Hello Daaim, Please consider my kindly disagreement. First, I like this young man attitude that ratings don’t matter especially since I believe that he wants “to be” and “to beat” the best. Can you really put a rating on that kind of desire? Secondly, respecting his African-American heritage, the issue may be one of cultural diversion. His epistemic or cognitive knowledge appear to be grounded in African related symbolic imagery (being the best) vs. a euro-centric perspective grounded in a quantative assessment through counting and measuring (ratings). I like the fact that he is setting no numeric limits on what he believe is his unlimited talents. The best thing about young Ronald Best approach it that it keeps his opponents guessing or in fear of his unlimited talents!!! Yes… he wants to beat the best, but if you aspire to be a Grandmaster, then ratings matter. If he only wants to play casually, then ratings make no difference, but reaching the highest of levels in a system based on rating standards, ratings always matter… especially when you’re younger. Colleges give scholarships, awards and opportunities based on these metrics. Saying ratings don’t matter is like a college student saying Grade Point Average doesn’t matter. The stuff about epistemology and African-American heritage… well could be, but I’m not sure any of that applies to him, or other young Black players. Maybe, maybe not. We are merely talking a measurement of skill. How would he measure himself if not comparing himself by people with ratings (relative to his rating)? Now I would agree that it is not the only thing he should focus on, but ratings matter at his age. If he wants to become a GM, there is a window of improvement he needs to aspire to. That rating of 1850 at 13 is a good rating actually. He should work on improving the only standard we have for showing a measure of strength. Now if you want to call that Eurocentric, then so be it. Hello Daaim, Some one told me that “grades don’t tell you who you are they only tell you how hard you need to work”. I apply this logic to ratings. My opinion has been shaped from seeing too many kids burned out from chasing rating points instead of the creativity and beauty of the game. I agree, but measurements are still very important. Having taught at the university level for 14 years, I can tell you that grades are important although they do not account for all of the person’s potential. It indicates work ethic, pattern of consistency and aptitude. Ratings have a similar purpose. I don’t know if you have kids, but if your son or daughter came home with a bunch of Ds and Cs, would you say grades and GPA don’t matter? Probably not, but too many parents are. You can enjoy the beauty of the game if that’s your objective, but if Ron Jr. is talking about becoming a Grandmaster, ratings are paramount. Players are making GM at age 13 and 14 these days. It is a very involved an intricate process that is merit- and rating-based. Perhaps the kids you saw chasing points didn’t have the right direction. Chasing rating points is certainly not a good method for improvement, but should only be used to gauge incremental progress. Ratings are not everything, but they are something. I’m not sure what you have read that states that measurement and counting is somehow Eurocentric. Mathematics and counting was not invented in Europe, nor were the numerals we use for counting (today). When the Kemites and Kushites built the pyramids, do you think that they said math, counting and measurements don’t matter? They certainly didn’t put the structures up any kind of way and there was a mathematical and science involved. Europeans still can’t figure out how they were built. Africans have always been masters of math and science and we have to get back to this mindset. Why give the credit to someone else? Congratulations to Ronald Best, Jordan Best, Julius A. Wade Jr. and family! I write to also encourage that if it is at all possible and only if this has not yet occurred that Mr. Wade attempt to bridge a healthy relationship with a highly skilled, nurturing, and well-rounded player who can be encouraging and knowledgeable in helping these young brothers to make the jump to competing to win the open or GM level events. at a tournament and does his BEST and bests all opposition. This may be a dream to many but it is substantial nonetheless, at least in my humble opinion…. One genius to another..keep striving Brothers Best and Baba Wade Jr.
P.S. 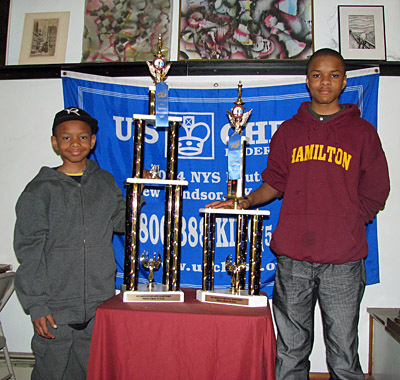 Correction Needed – Mr. Antoine Hutchinson is a strong player from Baltimore but he was not a scholastic chess phenom. Scholastically, he was strong in track, athletics, and academics. Please add for consideration/context – Mr. Brian Richardson who preceded me in age. His contact and what I consider a living legacy was invaluable to me when I began competitive chess in 10th grade! Peace and Blessings! Stay strong and keep up the great work! Lead by example! Diamond says hi! Ronald Jr. scored 3/7 in the National H.S. Championship. I hope he takes this experience and immediately begins studying his games deeply. Is someone working with him? I had a chance to talk with Julius Wade at the HS Nationals that just ended. He is a down to earth gentleman to say the least. We spoke a lot about how and what is required to reach the higher level of chess. I brought up the notion that earning the GM title is equivalent to earning a PhD. I believe that he knew exactly why I made the association. I congratulate Ronald and his younger brother profoundly for what they’ve accomplished thus far after learning from their Dad under what conditions they were able to make their stretch. I communicated the significance of the message I got from their Dad to my son to remind him of his blessings. As for ratings, what I would state is that it boils down to the simple fact that if you put in the necessary effort, your rating will improve. How fast? Well, that will depend on individual talent and perseverance. However, let’s not fool ourselves, Rating is Significant! I agree Guy, but you don’t want to scare Ron Jr. or his father into thinking he has to go through such pain so early in life. The Ph.D. is PAIN!! :-/ That’s why you usually do it when you have matured and are not fragile. In my view, Ron actually has a decent rating. Progression is not always linear and rapid. Ron simply has to bear down, have a plan and execute it. He also needs to play strong players as much as possible. His peers Josh, Justus and James have benefited from their exposure to competition. He needs the same opportunities. With a Ph.D. you are charged with creating a new mode of thinking, new ideas, new reality and be able to contribute to the world body of knowledge. There are three lengthy stages… course work, qualifying exam and dissertation. Each process is different from the another, but related. Many cannot make the transition between these stages and end up quitting. After the 2-3 years of rigorous course work, you have to sit for the qualifying exam which presents questions in your areas of concentration. I had three eight-hour exams (one for each concentration)… one each on Monday, Wednesday and Friday. They give you a pad of paper, the questions and you write for eight hours. You get two tries to pass all three, or you are expelled from the program. You may then be given an oral exam based on your written exam. It is pass/fail. If you pass, you then develop an original topic which has to be defended (as a formal proposal) and thus, defended in front of your dissertation committee of professors. This is the blueprint of your research. After this you begin your dissertation process. It can take from 1-5 years depending on the topic and research methods. Your committee guides you along and essentially decide your fate and whether or not you can go on. Your life is put on hold essentially and you are investing tremendous resources to get a return on your investment. Despite this about 65-70% of people quit. When you finally finish your research, it has to be defended in front of the committee (public is also invited) and they will judge you on the quality of your idea, maturity of thought and its possible contribution to the world’s body of knowledge. They then rule on your research on three possible results… pass, conditional pass with corrections, rejected. Usually there are tons of corrections to make before the submission deadline. It took me 6-1/2 years (12-14 hours/day) to complete this process. The average is seven years. It was tough, but as with any task you are trying to master, you have to have a regiment and discipline. It’s not an easy comparison (GM/PhD), but I hear it a lot. In chess, you have to follow well-defined rules and patterns and essentially pass three rigorous tests (norms). I have known people to get three GM norms in a span of eight months simply by studying intensely on their own and playing in a variety of prep tournaments. Sergey Karjakin earned a GM title at age 12 years 7 months and today it is common to earn the title at 14 or 15. You could never do this with a Ph.D. Nevertheless, earning a GM title is a mammoth task and you are required to pass three rigorous tests in a controlled environment. It can be done and it is common to do this very early in life. The two processes are very different, but I can see why people make the comparison. Thanks Daaim for the intuitive information on the painstaking process that’s mandatory to earning a PHD. As you have mentioned, the GM vs. PhD comparison is not that simple. I take that to mean, perhaps it is not known which one is more difficult to obtain. I don’t have a PhD or a GM title, so I could only speculate. Possibly one who has earned both would probably be the best to say which one he or she found to be more difficult to earn. However, I do wonder why many with strong academic background (B.S, MS. PhD) find it so difficult to reach the level of master, let alone GM, but yet can earn the PhDs, M.S, et cetera. Maybe the notion that we can achieve anything we work hard at may not be so true. Conceivably, it could be that our brain makeup allows each one of us, who puts in the required effort, to only to reach maximum capacity in only certain fields of discipline. We may never know, but now I have a clearer picture of why the PhDs get so much respect. They deserve it! My insights are as follows – in context. I hope that if you wish to chat more about this, please email me as I am not really into blogs (please contact Daaim for my email if needed). connectedness and community that in my opinion makes it difficult to commit more to chess. For example, ‘ I have never put in more than 1-2 weeks of consistent daily study of the game, and these periods have been rare. My intellect and ability are high but my time since my interest in serious chess began(in highschool) has included many activities of which I have completed and achieved much. I do in fact believe that the procedure (which varies by field and institution) of getting a PhD is tough but the development and training of becoming a true expert is very similar to GM chess training. My comments: I would simply state that if you work hard, smart, and accept help when needed, you can achieve anything. My comments: Our brains and bodies are biochemical as well as capable of some sense or range of free will. Recognizing a maximum or minimum…is unclear until a serious attempt to develop has been made. One example in academics is that all PhDs in one physics sub-discipline are not considered equal wiith regard to strength of physicist. To be the best[physicist or anything] requires application and updating as science evolves. I believe this to be true in chess as well. timescale required for talent development and application – consider pro athletes and singers – so I believe that a great skill to have is to perceive the multiple timescales per activity or goal and how best to achieve them. Good coaches, trainers, fathers, mothers, and elders express this understanding by action and advice. I will stop now, and wish you and family well! Well… I’ll tell you this. University studies mostly kills your chess… especially a doctorate. You can still play chess during undergrad, but grad school is very difficult. Doctorate… nearly impossible to play any serious chess. Why don’t those with higher education later make Master? So many factors… what age they started playing chess, their chess level before college, where they live, what they do after they finish their degrees. For the Ph.D., there is so much more riding on you getting your degree because your future is at stake. The opportunity costs are very high. On the other hand, a GM title is merely a symbolic dream for most and only a few can make a living at it so it becomes secondary. People choose other ways to make a mark… career, family, travel. Chess is not an activity that gives you much tangible return for the work you put in. While it is very difficult to do both, there are exceptions. There are a few chess players (very few) who have both. Dr. John Nunn became a GM and a Ph.D. mathematics both in 1978 (age 23)! He has had a different experience… his Ph.D. was smoother (five years) than his GM pursuit. He was actually doing both at the same time. Mathematics is complementary to chess… that helps. Dr. Kenneth Rogoff is one of the top economists in the world and earned his GM title in 1978 after trying professional chess for a short time. He gave up chess to pursue his Ph.D. and earned it in 1980. He has an interesting story and still follows some of the current games at top level. Why did he quit? Listen to this interview (start at 11:24). If anything, you’d have to earn the GM title first (when you’re real young) and then you have many options. Having a GM title can also help get you into elite schools. If you earn the doctorate first, it will certainly take you out of chess for years at a time… unless you are studying in a field that complements chess (i.e., John Nunn). Dr. Rogoff dropped out of high school and moved to Europe to be a chess professional only to give it up and start a storied career. They are BOTH difficult (as is any mammoth endeavor), but the GM/PhD comparisons are not as clear. The process of the doctorate is much more involved, more politics and more is required of you after you’re done. That’s my only point. In which field did you obtain your PHD? It was in International Affairs and Development, a field mostly for training diplomats, economic consultants and civil service. I also have an MBA and a BS in Computer Science. My chess activity declined progressively during school, but I must say I played less chess during my Master’s than my Ph.D. There is something that is indisputably attractive about someone who is clearly an ace, but by no means engages in self-promotion. Dr. Shabazz is a great role model in that sense. When I read of his academic credentials, I was stunned! I had been criticized (in the early days of The Chess Drum) for not putting my picture on the home page and for not putting my games on the site. I finally put a small pic up and a few games up, but it’s a joy to be able to see a site grow. It’s not about me. It is much bigger than me… but I still have to feed it. Seeing that Ronald’s 13-year old peers like Justus, Josh and James Jr. (all in the 2300 range) have won many national titles, have been named to All-American teams, have traveled around the world to tournaments, gotten media publicity and will probably win college scholarships, it shows that there are performance standards that Ronald can also benefit from. However, he has to recognize that ratings are an important part of how performance is assessed in our sport. Right now, he doesn’t. I’m sure Ronald saw IS-318 at the award ceremonies and hopefully their victory will motivate him. If he trains hard, it may be him getting one of those top trophies. Hello Daaim, I still am giving young Ronald the benefit of the doubt in both his understanding of his 1850 rating and his anticipation of the temporary status due to his express desire to be both a doctor as well as a grandmaster in chess. Maybe he will accomplish both great objectives or maybe economic or time reality will cause a choice to be made. He will need parental as well as mentoring in both area but today we can appreciate his accomplishments and inspiration of other scholastic players in the Baltimore area.